Lenovo’s ThinkPad L390 Yoga is in many ways the quintessential work laptop. It’s chunkier than many other thin-and-light laptops in its price range, but it also packs a lot of enterprise-friendly features, such as temperature and shock resistance and a variety of connection ports. At the same time, the L390 Yoga has some nice touches to help it stand out from the enterprise pack, most notably a keyboard that feels great to type on and one of the best clicking mechanisms you’ll find on any trackpad today. If you’re not planning to do much work outside—and can therefore tolerate the L390 Yoga’s limited screen brightness—this might be your next workhorse. 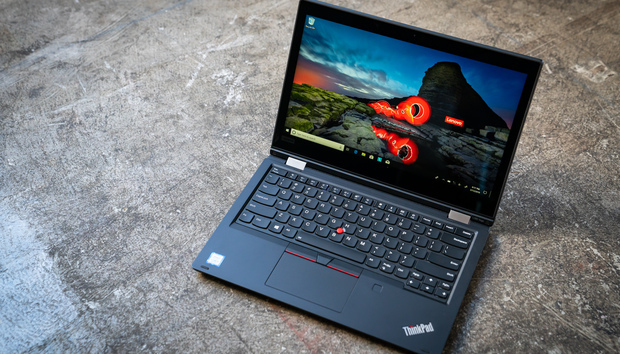 We reviewed a $1,079 version of Lenovo’s ThinkPad L390 Yoga, which has a 13.3-inch 1080p touchscreen, a 1.6GHz Intel Core i5-8265U processor, 8GB of DDR4 RAM, 256GB SSD, and Windows 10 Pro. True to Lenovo’s Yoga branding, the L390 has a 360-degree hinge so you can flip the screen around and use it like a tablet. The exact configuration can vary depending on retailer, though. Staples and CDW, for instance, sell a $1,120 version of the L390 Yoga with an infrared camera for face recognition, but Lenovo’s website does not. You can also configure a model on Lenovo’s website for as little as $899, with 128GB of storage, no keyboard backlighting, no fingerprint reader, and Windows 10 Home instead of Windows 10 Pro. Conversely, you can build a fully-loaded laptop with a Core i7-8565U processor, 32GB of RAM, and a 512GB SSD for $1,893. 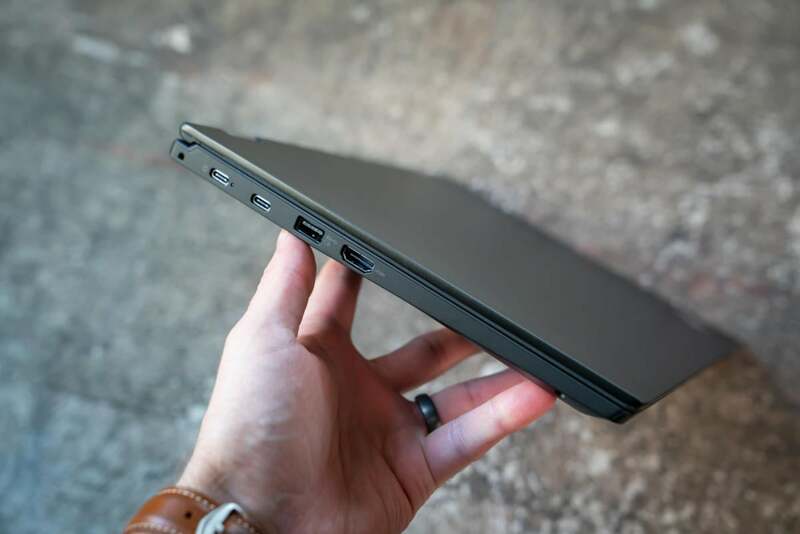 The ThinkPad L390 Yoga isn’t exactly thin and light. Weighing in at 3.44 pounds and measuring 0.74 inches thick, it feels more like a modernization of yesteryear’s hefty ThinkPads than a peer to svelte laptops like Dell’s XPS 13 and Lenovo’s own IdeaPad 730S. Like other Lenovo Yoga laptops, the ThinkPad L390 can turn into a tablet or stand up in tent mode. 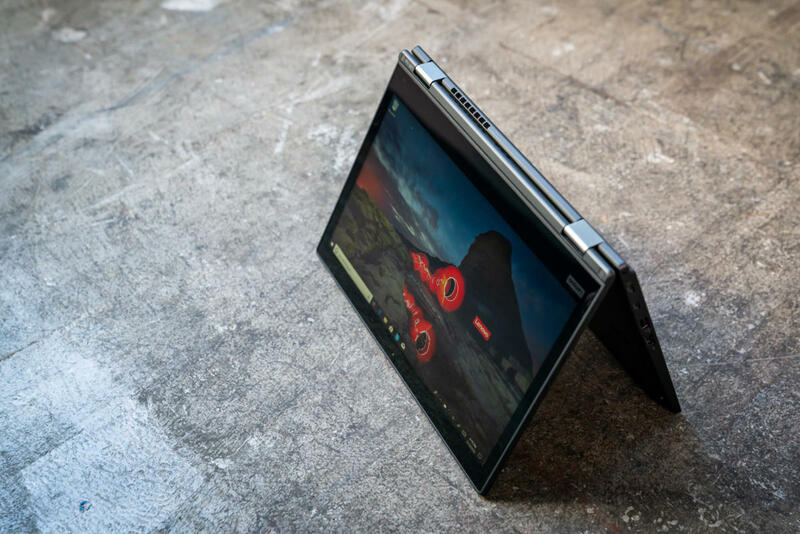 That feeling is reinforced by the ThinkPad’s display bezels, which measure 0.6 inches along the sides, with a 0.7-inch upper bezel and a 1.5-inch “chin” under the screen. Thick borders like those are common among convertible laptops, but we have seen some exceptions, such as HP’s Spectre x360 13. Then again, those slicker laptops haven’t been subjected to the various shock, vibration, dust, and extreme temperature tests that the L390 Yoga has gone through. The display itself is an IPS panel with great viewing angles, but it’s also one of the dimmest screens you’ll find on a laptop in this price range, maxing out at 258 nits' brightness. 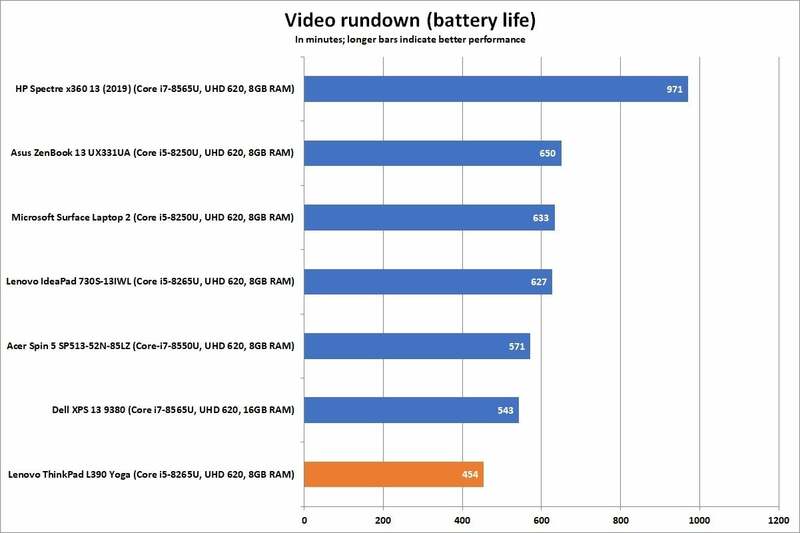 By comparison, the aforementioned HP Spectre x360 13 reaches 350 nits, Microsoft’s Surface Pro 6 reaches 378 nits, and Lenovo’s IdeaPad 730S hits 317 nits. In practical terms, the L390 Yoga requires almost full brightness to use comfortably in well-lit rooms, and outdoor computing sessions can be frustrating. The ThinkPad L390 Yoga’s keyboard is the star of the show, though we’d like to meet someone who actually uses the TrackPoint nub. Lenovo also manages to pack in more keys than usual for a laptop of this size, including an extra-wide Escape key and dedicated keys for Home/End/Insert/Delete. The arrow keys are all roughly the same size, with Page Up/Down keys placed comfortably above the left and right arrows. There’s even a bit of spacing between each cluster of four Function keys. 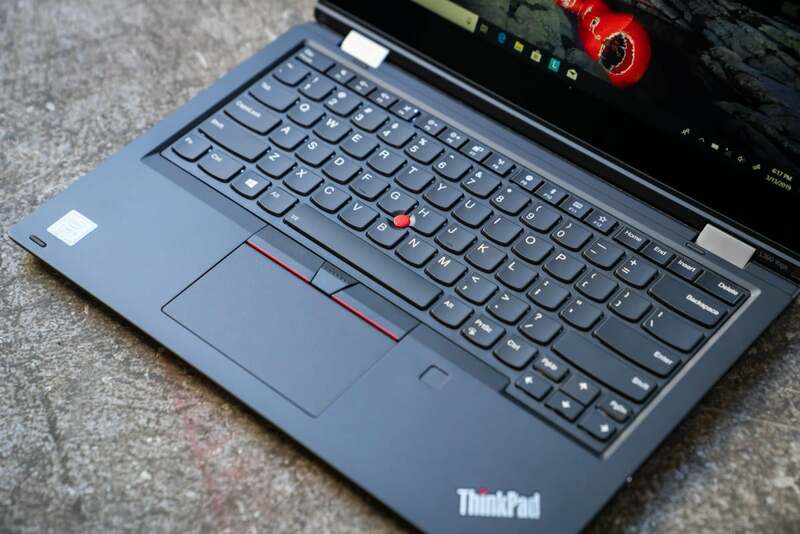 The only nitpick is Lenovo’s continued insistence on putting the function key on the bottom-left corner of its ThinkPads, where most Windows laptops put a Control key instead. Flipping the Fn and Ctrl keys around requires a trip to BIOS settings, and leaves you with mislabeled keys. The ThinkPad L390 Yoga’s luxurious feeling extends to the touchpad. With most laptops, I prefer tapping, because the clicking mechanism is too loud and rigid. Clicking the L390’s trackpad almost feels like pressing a key on the keyboard, and I found myself using tap-to-click less often as a result. While the touchpad could be larger, it uses a mylar coating that’s easy to glide around on. Of course, the Yoga L390 also retains the ThinkPad line’s iconic TrackPoint nub at the center of the keyboard, along with dedicated left- and right-click buttons above the touchpad. I’ll never get used to the former, which now feels more like an aesthetic flourish than a useful input mechanism, but keeping one hand on the touchpad while using the other hand for button clicks can be efficient when you’re not typing. Beyond the keyboard and trackpad, the ThinkPad L390 Yoga justifies its hefty design by including plenty of ports. This is the first time Lenovo has abandoned its proprietary ThinkPad charger, instead opting for three USB-C ports (two on the left side, one on the right). All three are USB 3.1 Gen 1 ports, meaning they support transfer speeds up to 5Gbps. I was thankful for the change, especially after a recent trip in which I used a single charger for the laptop, an Android phone, and a Nintendo Switch. Lenovo also boasts of “anti-fry” protection on its USB-C ports, which can guard against damage by poorly-designed third-party charging cables. The ThinkPad L390 Yoga trades proprietary charging for USB-C at last. The ThinkPad doesn’t mandate USB-C for every connection, though. 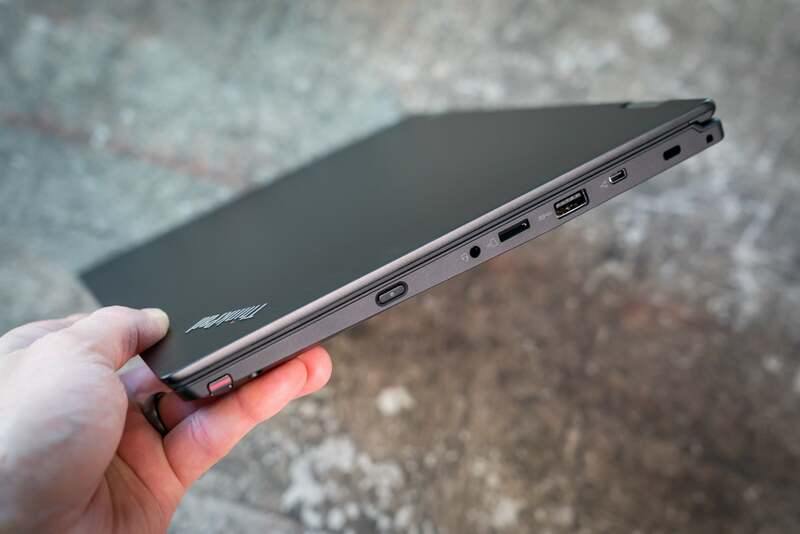 The laptop’s left side also has USB-A and HDMI ports, while the right side packs a second USB-A port, along with a headphone/microphone jack, a MicroSD card slot, an ethernet extension connector, and a hole for security locks. It would’ve been nice to have a proper ethernet port, a full-sized SD slot, and Thunderbolt support, but the port arrangement still feels generous at a time when USB-C is starting to replace everything. It’s easy to miss, but the ThinkPad even includes a small active stylus with 2,048 levels of pressure sensitivity, tucked into the laptop’s bottom-right edge. It’s no replacement for, say, a Microsoft Surface if you’re looking to do serious drawing or graphic design work (Microsoft’s Surface Pen has twice the pressure sensitivity and is much larger), but it’s good enough for handwritten notes in OneNote, or document markup in Drawboard PDF. Don’t forget about the stylus parked near the L390 Yoga’s front-right corner. 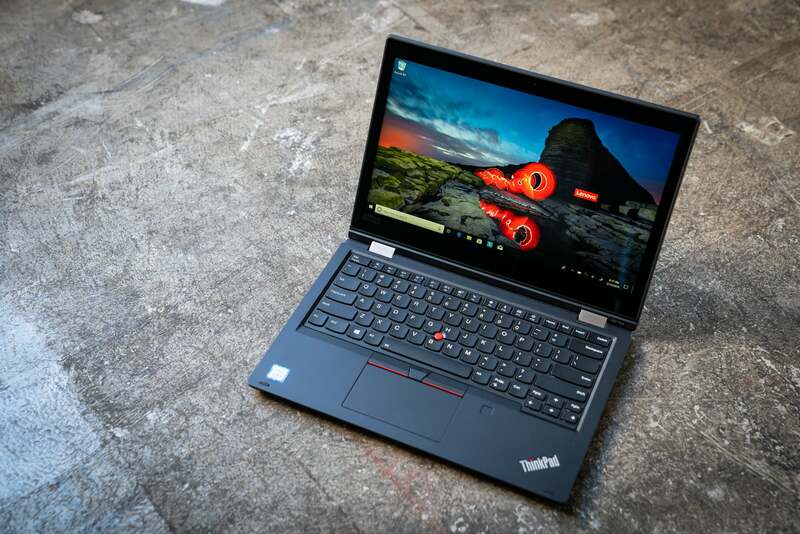 Surprisingly enough for a business laptop, a fingerprint reader is optional on the ThinkPad L390 Yoga, though it’s included with all but the cheapest configuration. Unlike earlier ThinkPads, it also stores fingerprint data within a chip on the sensor module itself, which is more secure than sending data to the system’s host processor for authentication. The webcam is less state-of-the-art, though, providing just 720p resolution for photos and videos. The lack of face recognition on most models is a downer. As for audio, the ThinkPad L390 Yoga taps Dolby Audio for speaker tuning and equalization. The result is decent sound quality for movies or music, especially at moderate volumes, though it’s still a little on the thin side overall. 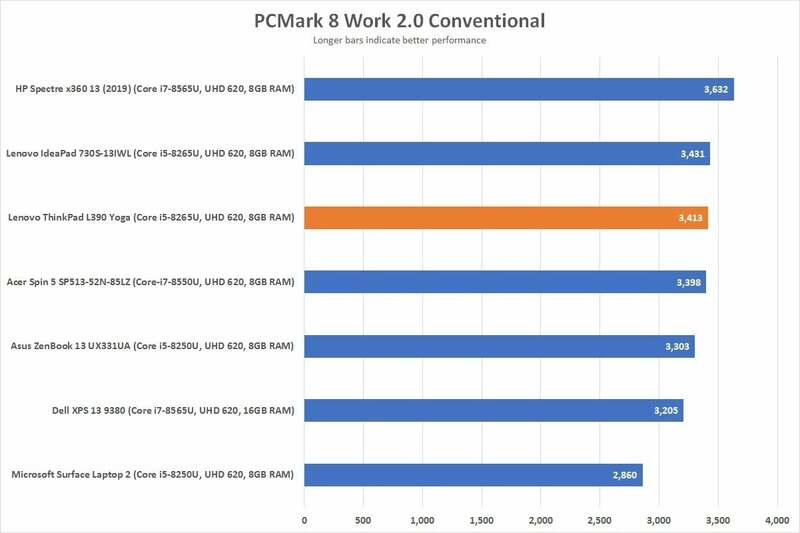 Because the Lenovo ThinkPad L390 Yoga is a work machine, PCMark’s Work 2.0 test is arguably the most important benchmark, simulating a battery of productivity tasks such as word processing and video chat. A score of 2,000 or better indicates satisfactory performance. 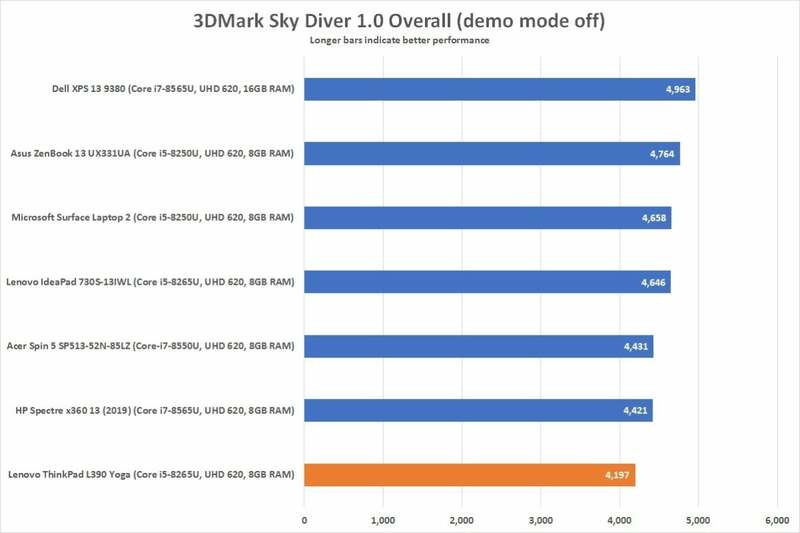 Fortunately, the ThinkPad L390 Yoga came out near the top of the pack, no doubt assisted by Intel’s new “Whiskey Lake” Core i5-8265U processor. 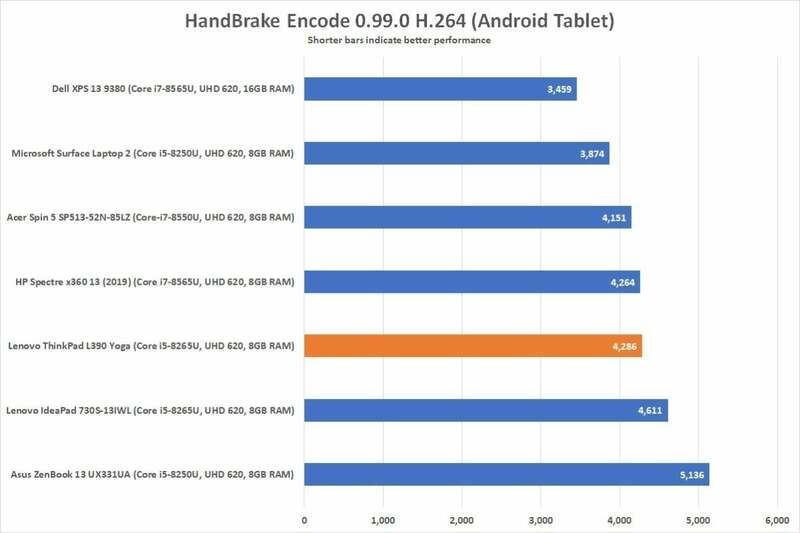 Performance was nearly the same as Lenovo’s IdeaPad 730S, which features the same CPU, and was predictably behind HP’s Core i7-based Spectre x360 13. Surprise, surprise: Work laptop does well on work benchmark. In other tests, the L390 Yoga falls roughly back into line with other laptops in its price range. Cinebench, for instance, measures a brief burst of CPU activity as it renders 3D graphics, and has the ThinkPad L390 Yoga came out slightly behind other Core-i5 laptops. 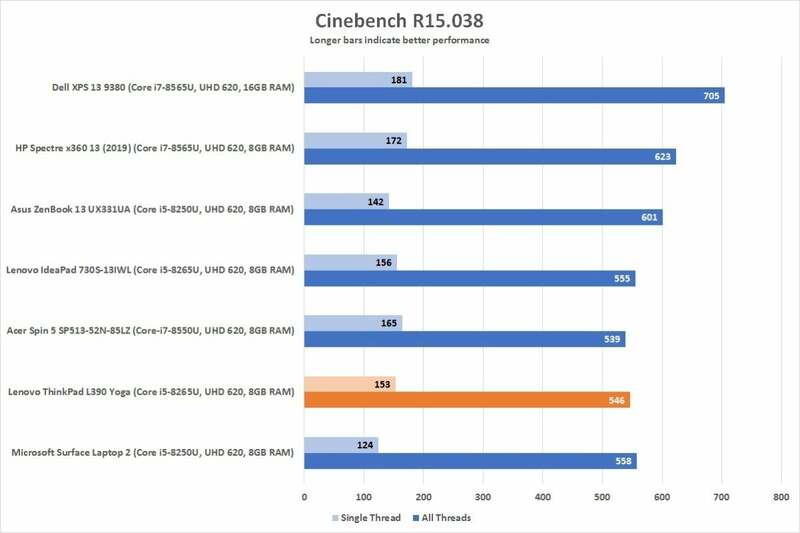 Bursty performance is less of a selling point for the L390 Yoga, as seen in its Cinebench score. The L390 Yoga’s score in HandBrake, which encodes an MKV video file to the MP4 format, was also nothing special. This is a quad-core laptop, so we’re not surprised that it handled the encoding in closer to one hour than two hours. HandBrake's extended test can show how a CPU handles itself under workload and heat pressure. The ThinkPad L390 Yoga posterd a middling score compared to similar systems. The ThinkPad L390 Yoga may be aided by its larger design from a thermal perspective, but its single grille underneath the laptop’s back-right side isn’t doing anything unique to keep the laptop cool over long periods. Another non-surprise: You wouldn’t want to use the L390 Yoga for 3D games. The only real letdown here was battery life, with the ThinkPad L390 Yoga averaging 7 hours and 34 minutes in our video rundown test. This is one of the worst scores we’ve seen among modern thin-and-light laptops. The Lenovo ThinkPad L390 Yoga's battery life is a disappointment. However, it’s not out of line with some other ThinkPads like the L480 (8 hours and 13 minutes) and the X1 Tablet (7 hours and 6 minutes). At least the new USB-C charger can bring the L390 Yoga back to 80-percent of a full charge in an hour. Should you buy the Lenovo ThinkPad L390 Yoga? While the Lenovo ThinkPad L390 Yoga isn’t most attractive laptop you can get, it compensates for its lack of style with a killer keyboard, a satisfying trackpad, and lots of ways to connect with external devices. You may not enjoy lugging it around or using its dim display outdoors, but it could make work a bit more bearable when you’re stuck at your desk.